Cross-sectional, correlational analyses of data from two separate studies were conducted to examine the correlates of adjustment among family caregivers of women with disabilities. Participants included 40 caregivers of women with spinal cord injuries in the first study and 53 caregivers of women with cerebral palsy, traumatic brain injury, and other neuromuscular disabilities in the second study. 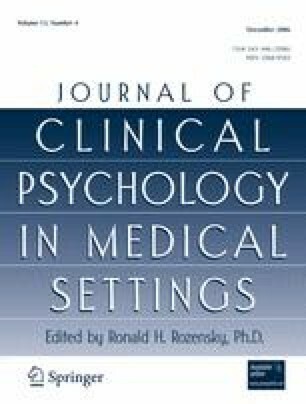 It was hypothesized that a negative problem-solving style would be associated with greater caregiver distress in both studies, and that caregiver adjustment would be associated with care recipient depression in the second study. As expected, results indicated that a higher negative orientation toward solving problems was associated with caregiver depression and lower well-being. However, in the second study, caregiver characteristics were not associated with care recipient depression. These data indicate that considerable variability exists in caregiver adjustment. Methodological limitations and the implications for research, service, and policy formation are! discussed. This research was supported by grants from the National Institute on Disability and Rehabilitation Research (#H133N5009 and #H133B980016A), National Institute on Child Health and Human Development (#T32 HD07420), and Centers for Disease Control and Prevention—National Center for Injury Prevention and Control (#R49/CE000191, #R49/CCR403641, and R49/CCR412718-01) to the University of Alabama at Birmingham. The contents of this report are solely the responsibility of the authors and do not necessarily represent the official views of the funding agencies.